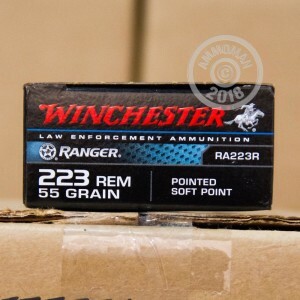 This Winchester Ranger ammunition combines the high velocity of the .223 cartridge with an aerodynamic soft tipped projectile that produces strong expansion yet relatively mild penetration. This makes it an ideal defensive round for AR-15s and other rifles and a popular choice with law enforcement agencies across the country. These rounds have similar in-flight ballistics to M193 ball ammo, firing a 55 grain projectile at 3,240 feet per second out of the muzzle. They are manufactured in Oxford, Mississippi and use non-corrosive Boxer primers and reloadable brass cases. 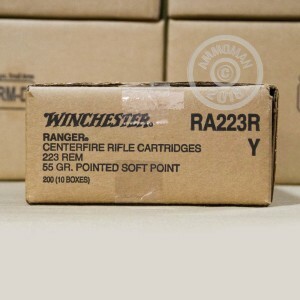 Each case contains 200 cartridges divided into 10 boxes of 20 rounds each. 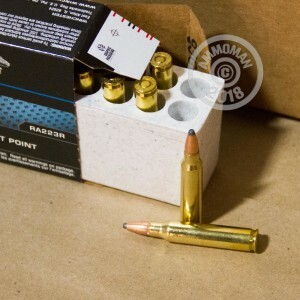 Grab this ammo or any other items totaling $99 or more to qualify for free shipping from AmmoMan.com!